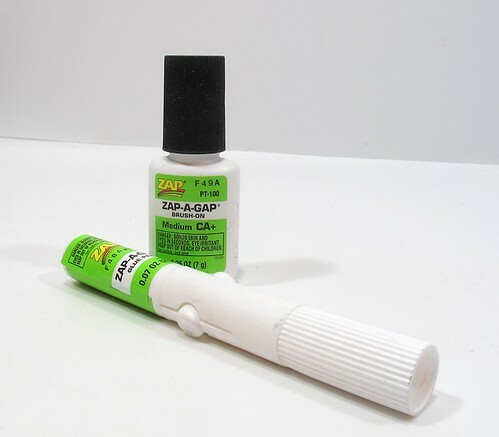 Regular readers will know of my preference for the Zap-a-Gap range of superglue. Normally this is supplied in bottles but recently two more options have appears on the scene. The pen is potentially the most useful. If you can accurately place drops of glue on on a model then that saves putting a pool on some plastic and transferring glue. Sadly, despite a cap including a short pin being part of the package, the nozzle always seems to be bunged up. Doesn't seem to matter which way up you store the thing either. On the other hand, paintable glue is brilliant. I've been sticking etched brass to plastic with it and it's a lot easier than applying with a bottle. The cap has a brush inside. My only complain is that the pot is 7g in weight and I recon it won't last that long. It really needs holding down too as the small footprint makes it an easy spill. I'll be bagging a spare as soon as I see one though. For a generic Dapol body stuck on a 1980s Peco chassis, I'm thinking this looks OK now it's finished. Weathering was simple enough, first, the blue paint was dry-brushed with the same colour let down with pale grey. Black bits were dry-brushed grey, anything metal with rust. Then a wash of Vallejo flat earth with a hint of the same firms flat brown on the metal areas. The trick is to put it on and then remove most of the paint with a wet brush, working in downward strokes. Once dry, some Humbrol weathering powders - black and smoke - were worked over the surface, again finished with downward strokes with a stiff brush. The aim was a dirty finish but with the colours showing through. No point on starting with a yellow wagon if it ends up the colour of a turd instead of a buttercup! found on the Black Dwarf Lightmoor website. The original appears on Page 29 of Keith Turton's eight colleciton of Private Owner wagons. From this the ends appear top be the same colour as the solebars. After a little discusion, the best guess is that this colour is the same as the wording on the side - blue. Pity as I was hoping for red but never mind. So, the solebars and end between the corner plates have recived a coat of Humbrol 25 and very bright the result looks too. I can't see the wagon lasting long in this sort of state so a dose of weathering is in order. 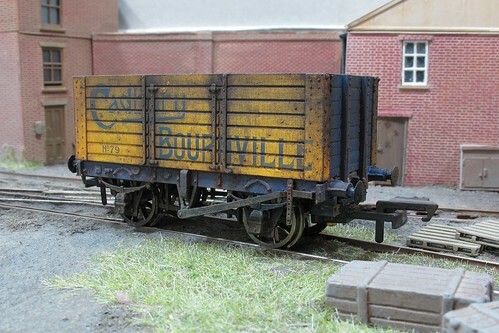 I'm planning to use this wagon on Edgeworth so it needs a set of tension lock couplings fitting. 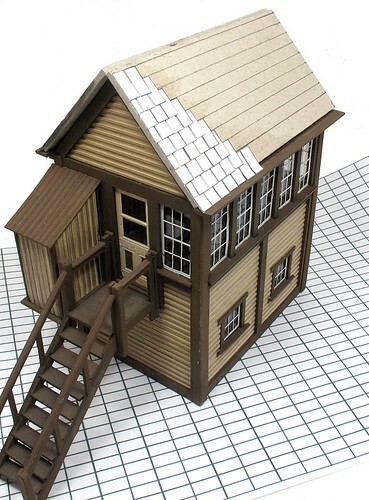 The aged Peco moulding is designed around there version of the Hornby Dublo hook with a grudging acceptance that you might prefer something a little more modern. First attempts at fitting a Bachmann spares coupling involved lashings of superglue but the things barely held on with the wagon upright so they wouldn't do for operating. In the end, a longish brass 10BA (I think) bolt was secured through the coupling, mounting stuff and wagon floor. With the head countersunk in the floor, I was just able to get a nut on it. This should be pretty bomb-proof now! Detail-wise, the only change I'm making is to replace the "iron" door bangers with large lumps of "wood" to match the prototype. They look a bit like squared-off codpieces to me but that's how the real thing ran so that's what I've made. 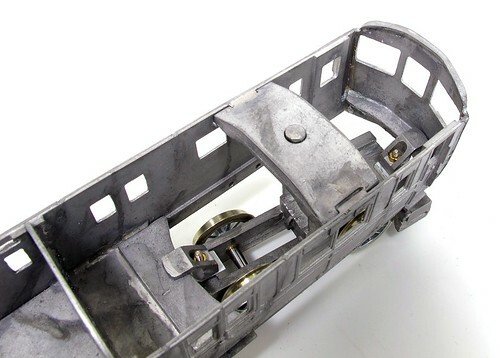 The Peco chassis locates in the base of a Peco wagon kit with the aid of a lots of spigots sticking up in to the floor. Obviously the Dapol body doesn't have these so I carefully measured and drilled the 1.5 and 2mm holes required. It was a couple of hours later I realised that the card packing included a full-sized template to aid the modeller. Anyway, along the sides, I cut the spigots short so the holes didn't need to be drilled all the way through the surprisingly thick floor. There are some holes for the W-irons and bufferbeam unit. By the time this kit was produced, the moulds were obviously getting worn. One of the buffer shanks had to be drilled out (1.5mm bit) and there was some cleaning up to do with a sharp knife - not easy as the material is rubbery. I think the kit has been re-tooled as I'm sure I've built one with metal rather than plastic buffers which do spring properly. Everything was stuck in place with superglue - normal plastic solvent won't hack it here. Nylon bearings and Bachmann wheels are fitted. The axles needed some of the pinpoint filing off the ends as they are a bit long for this kit. I wonder if Peco axles are slightly shorter? 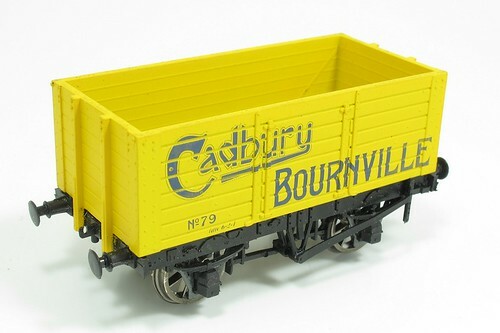 Loitering in the BRM office a few months ago, I spotted the pre-production shots of a limited edition Cadbury's wagon were were going to commission from Dapol. By the time I'd seen them, the bodies had already been assessed and comments passed back to the manufacturer so this one was surplus to requirements. Since it's future probably involved being stuck in a drawer and forgotten, I liberated it with a view to sticking a kit built chassis underneath. My plan to do this quickly evaporated but last week I found myself in Modellers Mecca and on the counter was a box of cheap kits. 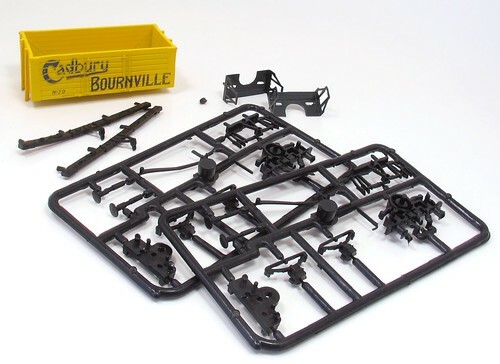 £3 later I'm the proud owner of a Peco Wonderful Wagon kits chassis kit. Not state-of-the-art but then neither is the body so I can live with this. More to the point, I didn't have to dig through my stash of bits to find another kit. The Peco chassis was packed on the 10th December 180 by S.W. according to a slip of paper in the packing. Most of it is made from rubbery material to allow the working axleboxes to spring in the metal W-irons. It's designed to be fitted to a Peco kit, but that's not going to stop me. Should you want a similar wagon, it can be bought RTR here. 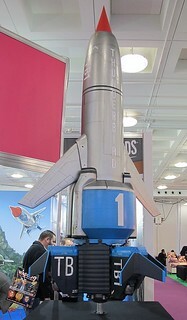 With my journalist hat on, I headed to London on Wednesday to the annual Toy Fair at Olympia. It's where we see what everyone will be fighting over in 11 months time for Christmas. This year is the year of the quadcopter. The things were everywhere with many stand having a large selection in all sized from tiny to massive. Some of these things are over 2 feet across so I can see the upper classes having fun blasting them out of the air as a change from clay pigeons. That and car boot sales being full of unwanted toys in a few months time as people get bored. It seems that Thunderbirds is due for a new outing, this time with a mix of CHI and models masterminded by Gerry Anderson's son. Purists will be pleased to see that the updated craft don't look massively different from the classic 1960s versions and that we can forget the terrible live action film of a few years ago. No sign of FAB1 but let's hope the owner of the Rolls Royce brand doesn't make them go away and speak to Ford again. Obviously I was mainly looking out for model railway or boat related stuff. Railways were covered by Oxford Rail and Hornby and I've mentioned these over on MREmag.com. I caught up with the guys on Pocketbond and asked about their resin building range. Apparently it's back on the market but they are struggling to find anyone to make the stuff in China. Like the RTR manufacturers, they find the workforce tend to prefer better paid electronics work than smelly resin building making. Boats were thin on the ground. There were some RTR models including what appeared to be a nitro boat nearly 4ft long on the Flying Models stand. Big news is that Playmobile are producing a radio control unit for their boats later in the year. A complete package, you just slot it under the hull for power and control. Using a pair of water jets, there's no need for rudders or exposed propellers. The surprise is that it's 2.4mhz - the firms previous RC efforts have been 26mhz - and 2.4 doesn't penetrate water very well. Presumably as the unit is only just under the surface, this won't be an issue, especially as the range doesn't need to be huge. I can see plenty of grandads buying in to this and others just grabbing the module to put under a scale boat to save the effort of fitting proper RC. Sticking with RC, Revell have a nice little fire engine model that's nowhere near scale but could easily yield parts to fit in a 7mm scale model car. 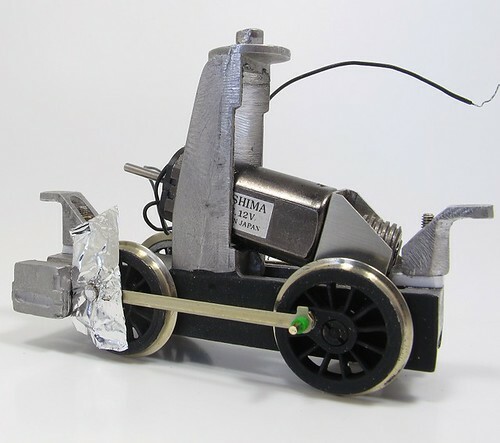 Top speed isn't impressive (for kids) but with a heavy body on top, might work for modellers. £14.99 gets you a toy to try out anyway. 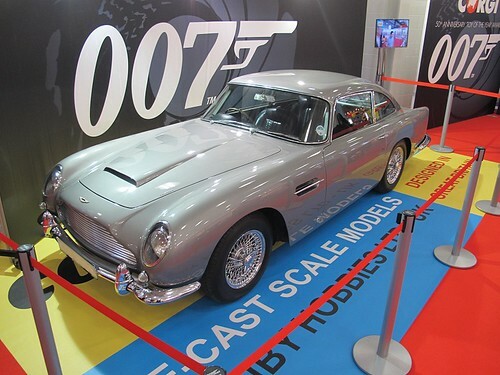 More photos from the Toy Fair here. 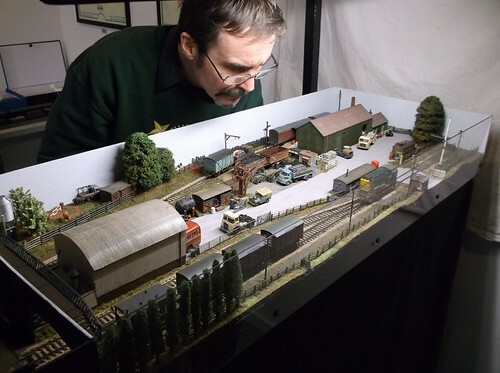 Last week, one of the best modellers I have ever known, John Webb, died. As you can see from the photo above, I knew John for many years. I think this was taken around 1984. He was incredibly modest about his skills but always turned out the most breathtaking modelling. Several of his locos won gold medals at the Model Engineer Exhibition and I remember him bringing down to the club a set of coaches that had just picked up a silver. This disappointed him as he thought they were more bronze medal standard and that would have given him a complete set! His Midlands Spinner, Crampton and steam railcar were all delights to behold and as good a model of each as you could ever wish to see. That's not to say John was a desperately serious modeller. Working as one of the Rover car companies pattern makers gave him access to woodworking machinery which he used to produce excellent rolling stock box kits for himself and a few friends. One friend, Dave Elbourne, passed over a set of measurements that once the box was constructed, turned out to be half a wagon short. 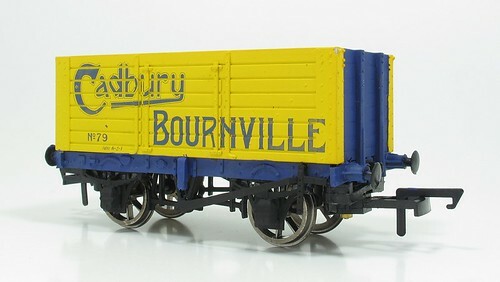 A few weeks after Dave had discovered this, and recovered from the ribbing that resulted from it, John turned up at the railway club with a special wagon. Looking to all intents like a normal OO model, it had a special feature - the length could be changed. 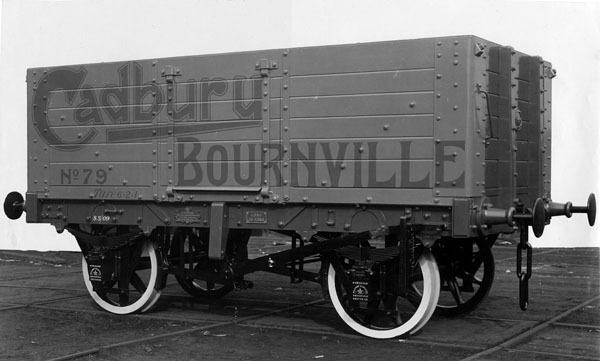 Clever work in the sides allowed the wagon to be extended or shrunk - to fit the stock boxes! Needless to say, the wagon worked perfectly on the layout so we'd include it in trains on "Scotland Street Yard" and operate it as normal. Occasionally you would find the headshunt a bit short but if the special wagon was in the train, no problem. Those watching the layout were amazed when a long train suddenly fitted into a short siding. 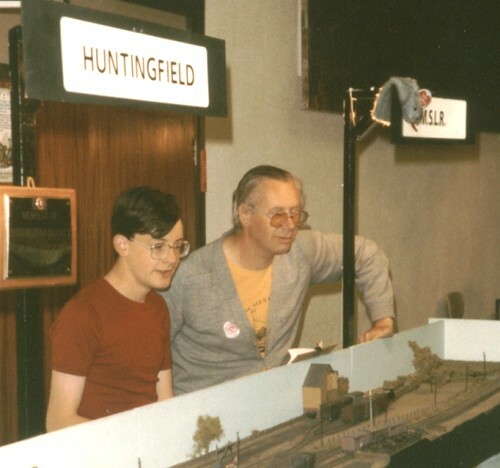 John's Magnum Opus was a model in EM gauge of Ambergate triangle. The model ended up 38ft by 18ft and a very odd shape. Baseboards were plywood and thanks to some free wood from work, enjoyed 12mm thick ends. Stable but b****y heavy much to the anoyance of certain members of the exhibition team who had to carry it! However, when running properly, the model looked fantastic and amazed the crowds with trains arriving from all directions. Fortunately the layout still survives. Now re-gauged to P4 standards, it has a permanent home and remains as a testament to its builder. The biggest worry with the railcar kit is all the waggly bits going on at the powered end. I've tangled with Walschaerts valve gear before and learnt a few lessons. The key is to anticipate problems and try to build them out before you start. Most of the "fun" will be at the cylinder end so I've been trying to do things right here. First up, the wheels have been shimmed to remove all sideplay. It's going to be tight behind the crossheads and you don't want any sideward movement resulting in things banging in to each other. Crank pins are fitted with a little superglue on the thread so they aren't going to unscrew themselves - it can happen and only results in badness. While I'm putting things together, plenty of black paint goes on as I'm not going to be able to take this thing to bits again to do that. Thinking about the clearances, I don't use the Romford rod retaining washer as it's a bit fat. Some tiny brass jobbies with hardly any thickness are more suitable. Soldering these on, I've coated the rod with permanent pen to stop errant solder sticking where it isn't wanted. A bit of aluminium foil provides a little spacer and again, stops the solder in it's tracks. The rods themselves are very nice. Etched in thick nickel silver, there's no laminating required. A tiny spin of a broach in each hole was enough to see everything running smoothly too. 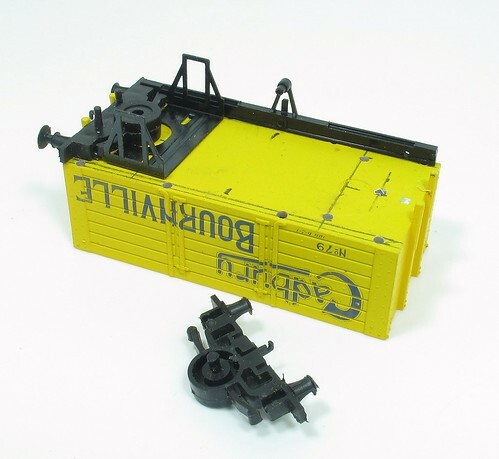 If NuCast made a GWR Railcar today, this is what the power unit would look like. OK, maybe not exactly like this but more this then a DS10 that it's supposed to be fitted with. The can Mashima came via a packing error with another kit. As it happened, I had a suitable motor to fix the problem and that left me with this one. The gearbox is a mystery but those are Romford gears in there with a 40:1 ratio. Worst job was filing the hole in the frames to make it wide enough for the gearbox to slip in. I was terrified that the whitemetal lump would twist but I think I've got away with it. Anyway, the power unit mow moves under it's own steam, so I can get serious with the waggly bits. 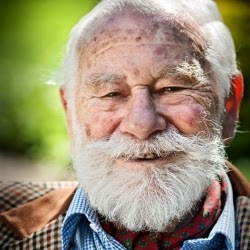 Robert Alexander Baron Schutzmann von Schutzmansdorff, better known as Bob Symes died on Monday after a short illness. Many will remember Bob from his TV work showing both models and serious engineering. He was a natural broadcaster whose demeanor and enthusiasm were perfect for explaining often complex projects. He really cared about the topic and it showed. More to the point, with that facial hair, he looked the part too - a proper Victorian engineer. Nowadays, you have rent-a-gob presenters who can just about read an autocue as long as the words aren't too long, Bob could have whipped out some spanners and done the job properly. They say you should never meet your heroes. Well, I met Bob and am happy to say he was just the same in person as he was on screen. 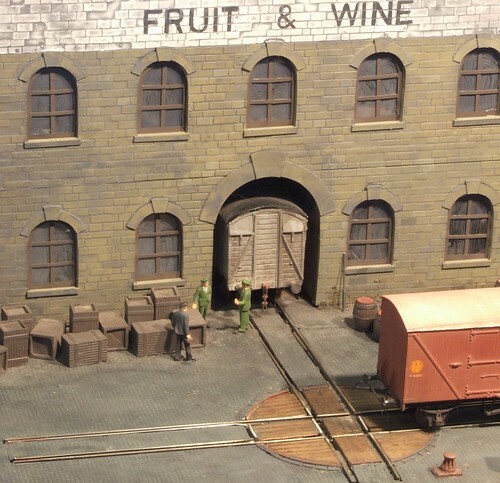 At the time, I was exhibiting Hellingly Hospital at Brighton Modelworld. Returning from a break, Bob was viewing the layout. I plucked up courage to start a conversation and quickly discovered he was not only familiar with the prototype (hardly a surprise in retrospect - an unusual railway near where he lived, he'd hardly miss out on that) but knew some aspects better than I did. I put down my inability to remember the overhead line voltage down to being slightly starstuck! An accomplished modeller and engineer, Bob produced the sort of innovative work that made the country great. 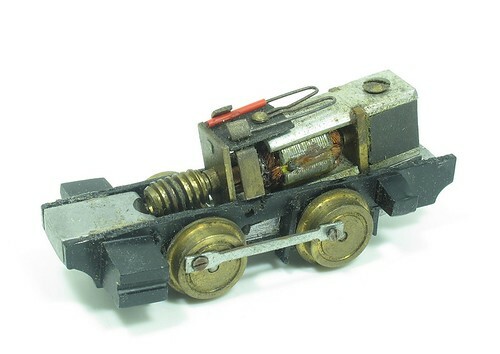 I remember reading about his efforts to build a real miniature diesel-electric locomotive. This wasn't an easy task involving much experimentation - not just a case of slotting a few bits together. Sadly, the hobby has lost one of its great names. Let's just hope some of the people he inspired carry on his work in the future. While I was visiting Milton Keynes MRC, I spotted this on the collectables and vintage test track. A BR Blue Deltic. 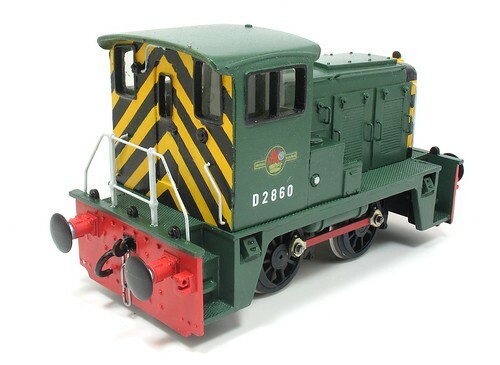 Despite the fact that this model has something to do with someone working at Bachmann, it's actually a re-painted Hornby Dublo diecast model. Collectors might have an attack of the vapours when they see what has happened to the model but since there are loads of them available and many of these are in pretty tatty played with condition, I reckon this is a good use for one. It certainly wears the blue livery well. 3D printing is the latest technology (assuming by latest, you ignore it having been around in various forms for the best part of 30 years) to have been spotted by the mainstream media. Certainly the BBC can't get enough of it at the moment even if I'm not convinced they get most of the details beyond "Wow, coloured plastic thing look at the pretty colours!". 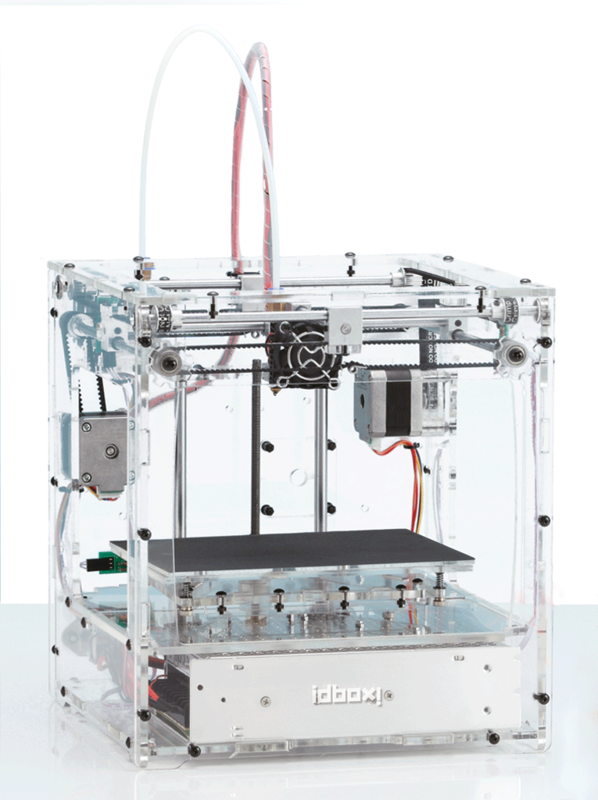 Anyway, a 3D printer is the latest toy everyone wants and amazingly, you can build one as a partwork. Not once, but twice. Spotted in my local WH Smiths, we have the V3 3D Printer. Supported by TV advertising, the machine certainly looks pretty. Price £625 although you can buy the whole lot in one go for £699 if you can't wait a year. 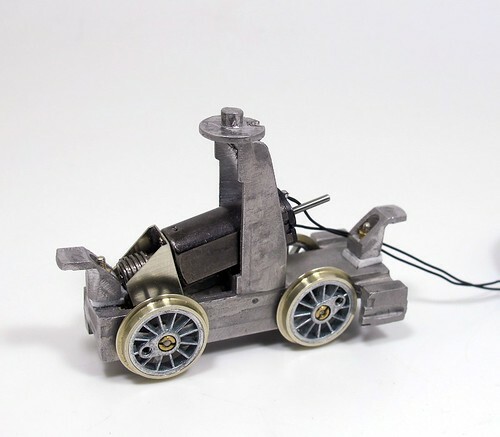 Use the software - AutoDesk123D: Design to create an object or 3D artwork. Corresponding 3D printing software: Repetier Host is scheduled to idbox customized version. Software is subject to change, but you can use the ones you have customized for idbox! Price £839 over 12 months. Both look like interesting machines and if someone offered me one for free, I'd jump at the chance. Even with 0.2mm resolution it would be a lot of fun although too coarse for many serious model making applications. As a test before having a bureau print the final high-res version, you could save an awful lot of time by having on on the end of the workbench. However, if you want to dip your toe in to the world of 3D print, and can stump up a pile of cash in one go, a better bet might be to head to Hattons for the Printrbot Simple Simple desktop 3D printer. 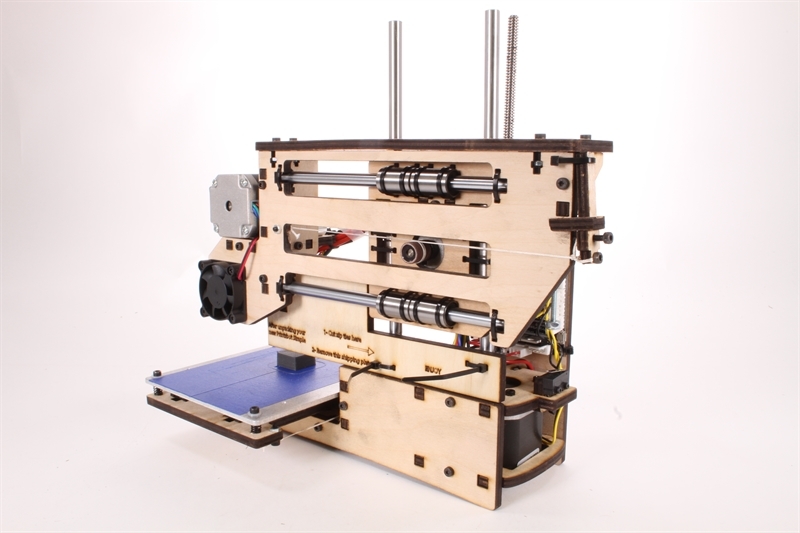 The V3 printer looks fantastic and I love the idea of assembling it myself. Cudos to the team who worked out how to turn it in to a partwork too. I wonder how many will be bought and built? I'd be tempted to buy it all in one go though. After all, by the time the machine is finished, technology is likely to have moved on - will it be obsolete by the time it's ready to use? Personally, I'll be checking out the car boot sales in 12 months as I have a feeling these are the new coffee makers - people will find that CAD isn't nearly as easy as you think and there is limited fun to be had with freely downloadable files. The results won't look like they came out of an injection moulding machine either. Second weekend of the year and it's time to break the toy train drought with a quick trip to St Albans exhibition. Early Sunday morning is the time to arrive - we bagged a place in the car park behind the show and then decided that a sausage bap in the adjacent Weatherspoons was more appealing than half an hour wait in the cold. One of the benefits of an in-town show is that there are plenty of facilities for eating and drinking. Gourmets might even have stocked up at the fantastic farmers market taking place at the same time. Once inside, we headed for the basement. The second hand stall is always worth a look although pickings were a bit thin by the time we arrived. Some Farish OO coach kits appealed but I decided to see if they would still be there later as I have too many kits already. Sticking with Farrish OO, over on the OO Gauge Association stand, Colin Snowden was showing off a vintage Black 5 from the company. While the bodywork might be horribly dated, the mechanism in the tender was amazing. The 2-pole motor drove a cardan shaft through a centrifugal clutch. 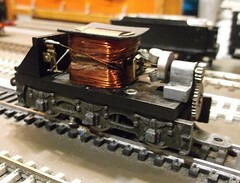 Power was fed through moving commutators. Given a dose of 12V, this arrangement looks great in action and is firmly on my list of desirable collectibles. While underground I also had another chance to enjoy Shaun Greet's lovely Evington St John, a micro layout stuffed full of detail. Perhaps not the most exciting thing to operate but it must have been great fun to build. The main hall is dominated by the trade and much time was spent chatting to friends while not actually spending much money. That's more luck than judgement as the trade is very good here and well supported by the visitors. 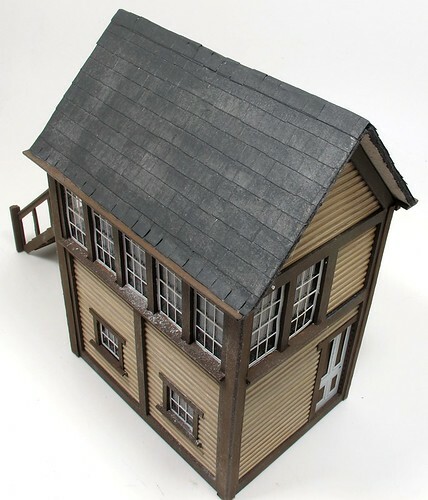 On the stage was the massive 2mm finescale layout Fencehouses. I remember seeing this in bare baseboards years ago at the 2mm society exhibition in Oxford. Now fully sceniced, it's a fine looking model and disproves the theory that a finescale layout has to be boring to watch with good length trains processing around the circuit. The balcony is a troublesome area for the show organisers being a bit of a nightmare to lay out. However they do a good job with demo stands and a couple of small layouts. Rixworth Green is the sort of small branch line terminus with a hint of Colonel Stephens about it. The sort of thing most people could build if they weren't obsessed by owning dozens of top link locomotives but decided to create a model that fitted the available space. All in all, an excellent show again. Visiting on the Sunday paid off as although the morning was busy, although not at busy as Saturday, by lunchtime moving around was pleasantly easy. OK, so I didn't bag the Grafar coaches which had gone by the time I took a second look, but I saw everything and spoke to everyone I wanted to and that's fine by me. If there is one thing this blog celebrates, it's workmanship. I don't care what I'm looking at, if it's really well made then I can appreciate it. So, when I received an e-mail from the Library of Birmingham a few days ago promoting a show by the artist Willard Wigan, I was straight to my calendar to see when I should book my ticket. Willard Wigan specialises in miniature sculptures. When I say miniature, I mean tiny in a way that us normal(ish) model makers will be blown away by. Most of the exhibits in this show are displayed in the eyes of sewing needles. Normal ones too - not those whopping darning types or the sort used to make carpets. No cheating here. If the sculpture isn't in a needle, it's on the head of a pin. 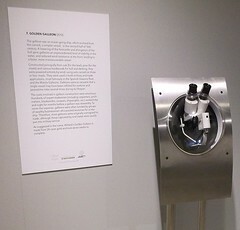 Obviously this is all pretty hard to show so the gallery displays each piece in a bubble containing high power LED lighting and topped with microscope eyepieces. This means you can try to squint and see the model in normal size or peer through the eyepieces for a proper view. It's quite odd walking around a gallery with hardly any pictures on the wall but things to peer in to instead. To help understand the work, a video of Willard's TED talk is on show. Best of all though, while I visited, the man himself was around and very happy to answer questions. Although not a permanent fixture in the gallery, I understand he's been there quite a lot. The school party visiting just after I got in certainly appreciated being able to talk to a real artist. The techniques involved in all of this fascinate me. Carving takes place using a pin sharpened to a knife blade. All work takes place under a microscope and requires the artist to hold his breath (inhaling the piece is easy apparently) and carve between heartbeats. And I thought soldering tiny bits of etched brass is fiddly! Painting is carried out with hairs from either the artists face or dead flies. I asked about paint and it seems he crushes the pigment using a ball bearing on a microscope slide, under the microscope itself so the pigment is fine enough to work. Rather more effort than opening a tin of Humbrol enamel. One area where there is a saving of course, is the materials. Many are made from Kevlar or nylon clothing tags. My favourite, a 3-mast galleon on a pin head, is constructed from gold, including the rigging but it's not like much of this precious metal was used up. Normally, Willard uses money spider web for rigging but it was too coarse for this model. Other highlights as the Last Supper, with all the figures, in a needle, Usain Bolt and a tiny recreation of Leonardo da Vinci's "The Hands" painting. The hummingbird above is worth a look too. Each piece takes at least 6 weeks of 18 hour days to produce. All this is incredible and needs to be seen to be believed. If you are within striking distance of Birmingham before 25th January, get yourself a ticket and go to see for yourself. Tickets are issued to regulate visitors as too many at once can make it difficutl for everyone to get a proper look at each exhibit - you have to view these 1 to 1! It's also worth visiting Willard Wigan's website for more photos. Take your mind back to 1963. May 1963 to be precise. Winston Churchill announced his retirement from politics. Dr No premiered in the USA. The Rolling Stones signed their first recording contract. 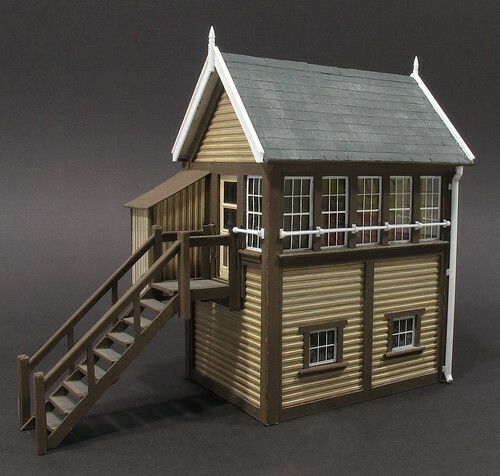 More importantly, Railway Modeller published a plan of Weymouth Harbour Masters office. (Many) Years later, I spotted this in an old issue and decided to build the model for Melbridge Dock. It's a popular and well-recognised feature on the layout. Lots of exhibition visitors have commented that they too have the plan squirreled away for future use. On Monday, I visited the Milton Keynes MRC and on their layout Milton Quays, there is the very same building. Nice, but a Beetle out the front (A 2-door sports car featured in the prototype photo that accompanied the article and plan) looks so much classier than the Vauxhall(?) they have used. Well, I think it does anyway. Back in the 1960s, there were several companies producing kits to make the static Kitmaster and Airfix model railway plastic kits move. 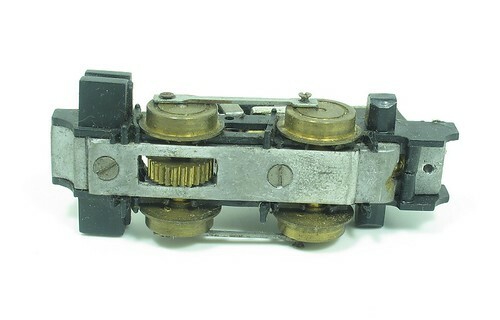 In my collection, I have this little mechanism part fitted to an Airfix Pug. Bought second hand, there are no instructions or other way of identifying it. I don't think it's likely to be scratchbuilt as the Mazak bits underneath are cast. The con rods also look like they are stamped rather than fettled from metal too. Nothing is provided for the cylinder rods by the way, I assume you use the plastic parts for this. So, I throw the question out to the crowd, who made this mechanism? Bringing up the rear in this nostalgia-fest, is my first kit built wagon. Built from a Keyser Model kits plastic kit, I recall finding the model in a shop in Luton. It was cheap enough for me to spend some pocket money and the box said it was "Super" in big letters. As it happens, the kit was reasonably simple to assemble but the plastic wheelsets running in plastic W-irons didn't work as well as even 1980s Hornby wagons. I didn't know much about adding weight to improve matters and even if I had, there wasn't a floor to stick it on. I obviously didn't know much about prototype liveries at the time either but brown with black ironwork looks nice and doubtless provided several hours worth of entertaining painting for me. The sharp eyed amongst you will have spotted that the wagon is no longer complete. Keyser provided more then twice as much plastic as you see here and that's because I converted the rest in to a van end poking from the door of a warehouse on Melbridge Dock. 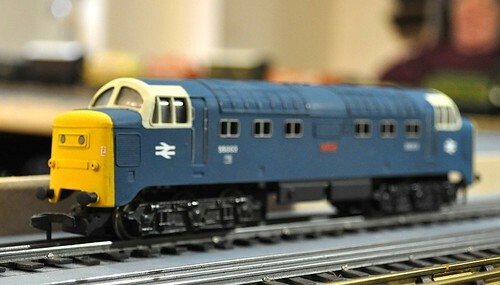 I mention this because as I struggle to persuade modellers at shows to dabble in kit-building, it's worth realising that if your first efforts aren't perfect, it's not necessarily wasted time and money, the odd scenic item of rolling stock can usually be accommodated on a layout. Think grounded body or ancient wagon rotting at the end of a siding. Which is probably why I still have this end of the wagon. One day I'll find a use for it. In the same box as my first model loco, I also found my first efforts at scratchbuilding a locomotive. Based pretty accurately on a plan in a magazine for a Hunslet loco I now can't identify (I've looked but the piece of paper eludes me) the body is made from plasticard as I lacked the ability to work metal finely enough. 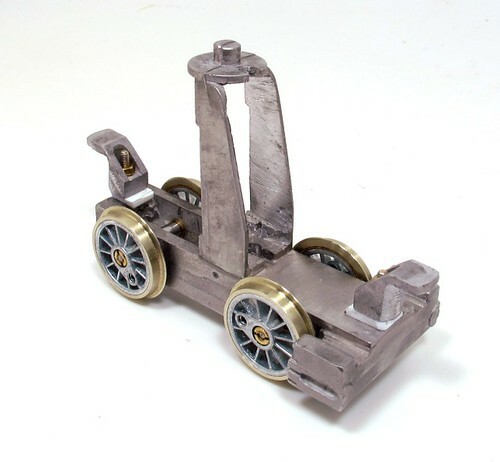 The chassis is a couple of brass strips and the surprisingly free-running wheels, Romford, also the makers of the gears. A cheapo motor was supposed to provide the go but as it's no longer in there, I assume I couldn't make the set-up perform as well as I had dreamed. I still can't mesh gears for toffee so nothing much has changed although I suspect it didn't matter much as the motor was so high-reving it would never perform at the crawl of my railway modelling friends kit built locos of the time. There's a bit of sophistication here - the handrail knobs would have been a major purchase on my pocket money. Buffers are nails with wider heads glued on. Hand rails show some early less than perfect soldering. I didn't do a bad job with the wasp-stripe buffer beams. Maybe I remembered to mask and paint before putting the buffers on, something I still don't get right nowadays. I can't remember how old I was when I built this but I'd guess around 15 or 16. The modelling has come on a bit but if I find that plan, it would be fun to have another go at building this prototype so I could see how far I've progressed over the years. A couple of days ago, I was sorting through the boxes that contain my Triang collection and I found this engine - the most important and precious one I own. Nearly 4 decades ago, at Christmas, I was presented with my first train set. It wasn't a "proper" train set. At least not in the sense that there was a box with all the bits in. 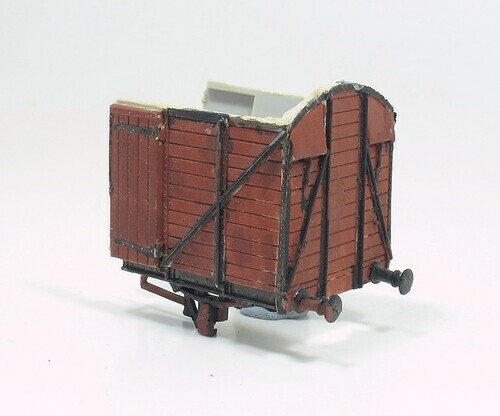 I received a Triang 3F, 4 Graham Farish wagons and a Hornby brake van. In addition, there was track and a H&M controller. The loco had been repainted by my Dad into a dull maroon with yellow dome. He'd thought I'd prefer this to a boaring black engine, and at the time he was probably right. The loco circled for many miles on various layouts passing through mixes of balsa wood and Lego landscape. When I joined the model railway club at 14, I decided to detail my engine since that seemed to be what everyone else did at the time. The maroon paint was covered with matt black, some cocktail stick based brake stand appeared in the tender and a smattering of real coal covered Triang's efforts. Some waterslide transfers replaced the original number and crests, a bit wonky but at least I had a go. 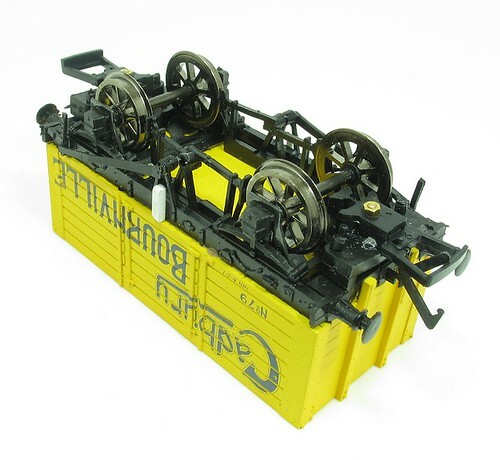 Eventually the insulating bushes on the wheels gave up and the model became static and vanished in to a box. At one point I had visions of treating it to a set of Romfords, wire handrails and perhaps even a better motor. With the Backmann 3F now available, thoughts turn to restoring the maroon livery that I first saw the model in. For the moment, it can sit in the display cabinet, a testament to the start of my hobby. Another casualty has turned up in the sidings at Leamington station and this one is more of a mystery and than the poorly loco a few weeks ago. We don't see much in the way of coaching stock nowadays. There's the Chiltern sets but apart from that, it's Voyagers and Sprinters'n'stuff. Where then, did they find what I presume is a poorly coach in Cross Country livery? Modelling notes are the flashing tail lamp protecting the end nearest the entrance point. A "Not to be moved" sign pokes out of the door side in case anyone tries to run off with it. Underneath, not a skate, but a pair of wooden chocks on one wheel to stop the thing running away to join it's friends on the rest of the railway. At the other end of the platform, the Friends of Leamington Station have been busy. 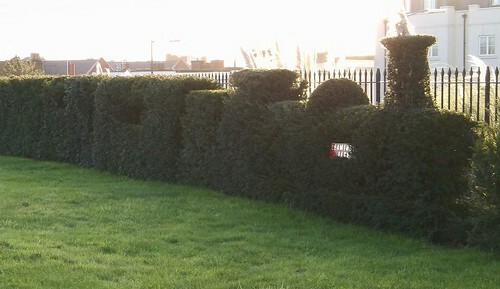 The "Leamington Flyer" is a topiary triumph, although I'm not sure quite which class of locomotive is represented here, but then I never was any good at identifying Great Western rolling stock. Hat tip to Scale Model News for pointing me at this excellent footage showing the model making department for Space 1999. Being born post-Thunderbirds, this was MY Gerry Anderson. It also featured the best space ship ever made - the Eagle Transporter. A proper pickup truck for space, just the sort of thing you'd need on a moonbase. All I want is a workshop that looks like this one! All that gleaming white plastic needed to be carefully colour matched with the existing paintwork applied by Mr Downes when he built the box. Splodging various browns around on the back proved that Alan, like me, knows that GWR Brown and Railmatch Underframe Dirt are basically the same thing. The wonderful Great W painted things in dirt colour! Anyway, with a bit of careful brushwork I browned all the plastic, except for the drainpipe which was painted weathered black. Not sure if this is correct but to be honest I was fed up with all the brown. The results look very nice to my eyes. At the moment I don't have anywhere to use the box properly so it's joined my collection of models - a rare item built by someone other than me in here. 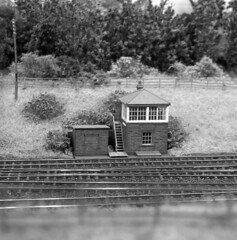 For the photos, I borrowed the L&WMRS O gauge layout "Kimble", popping the box in a field near one of the signals. I think with a suitable name board and some bedding it, it would look very nice here. Thanks to the festive season messing up deliveries, as I write, I haven't actually seen my copy of the February issue of British Railway Modelling magazine. Sorry to ruin any conspiracy theories, but those of us living away from the office don't get it delivered by horseman carrying the copy on a purple cushion, it comes out with the subscription copies same as everyone else. This makes the "What I have in BRM" post a little trickier as I can't really remember what I wrote for this particular issue so I'm relying on the post Ben has put up on RMWeb. 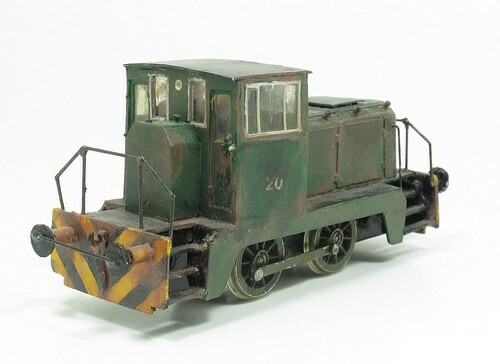 Probably the heaviest single loco in my collection - a 7mm scale 02 Diesel. 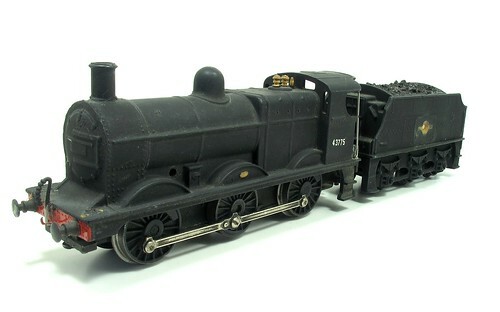 Built from a Tower Models starter kit, this is a cracking loco. Basically half-a-dozen whacking great castings sitting on top of a chunky chassis made mostly from giant U-section brass. Place this on the track and you might bend your baseboards! One little problem we encountered was that the Humbrol Acrylic green paint job looks great in real life. On the page however, the very matt finish looked lifeless. Even a shot of sating varnish didn't help so I had at the last minute to gloss varnish the model. Not high-gloss but more sheen than I normally apply to a model. This brought the green alive and all is well. Those wasp stripes don't look bad either, and this is the end I hand painted. The other end - well you'll have to read the article for that. Assuming all has gone to plan, my other contribution this month is a selection of layout photos from my Australia trip. With so many good pictures from the British Railway Modellers of Australia convention, it was difficult to know what should make it to the page. I'll post some of the others to the BRM blog in due course. It's great to showcase the antipodean modelling. This is a hobby popular around the world! Roof complete, I took the September 2014 issue of Model Rail as my guide for finishing off the Downes box. 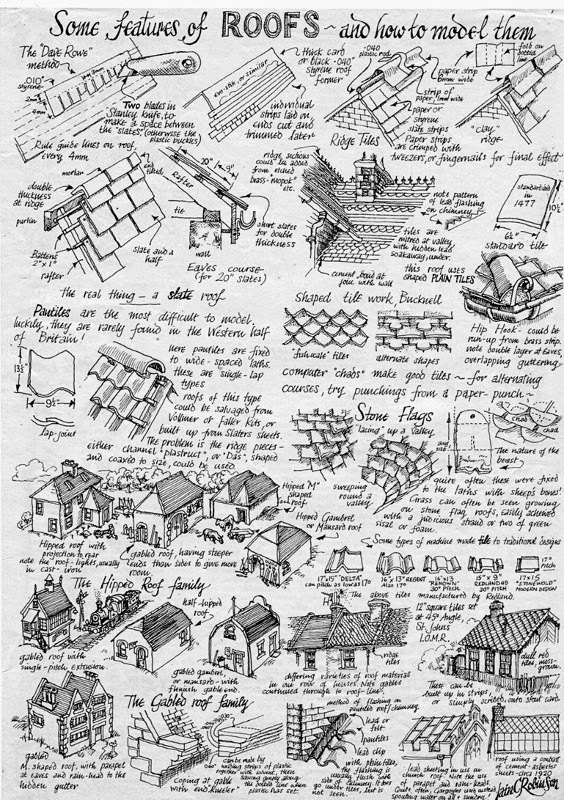 Looking at the photos of a very similar box he'd built, I took my cues from this - the plan is to produce an "Alan Downes" box, not necessarily a prefect scale replica of a real one. According to the magazine, ornate bargeboards were fitted but these looked horribly complicated to cut out of plasticard so I opted for much simpler versions based on a prototype photo. Strips of 40 thou plasticard did the job. A little microstrip along the top added a touch of detail. Finials were carved from 2mm square plastic rod. I know castings would be nicer, or at least look exactly the same, but I was enjoying this noodling around with plastic bits, something very much on the style of Downes. Incidentally, I did most of this while watching the film Battleship, not the greatest film in the world but who knew you could handbrake turn a full sized vessel just by dropping the anchor at speed? Anyway, along the front we have what I take to be a safety bar to protect signalmen hanging out of the windows. A 1mm diameter plastic rod with slices of tune stuck to small rectangles of 40 thou did this. I think the magazine shows real handrail knobs but I didn't have enough in stock and wasn't keen to buy a load in for this job. I suppose the handrail is 0.3mm too fat but my feeling is that these bars are often on the chunky side in real life. Possibly you need plenty of metal to retain a rotund signalman leaning out to exchange a token with a passing engine driver. The drainpipe is more tube, cut and glued to shape. I love working in plastic for this sort of job as using solvent, joints are pretty much instant and after a light sanding, any imperfections can be smoothed away with the same liquid. All in all, a very pleasant way to spend a few hours. Little worry about perfect prototype fidelity and lots of impressionistic modelling. The most obvious job required on the signal box is finishing off the roof. For help with this, I turned to Alan Downes nemesis and another master modeller - Iain Robinson. Some time ago, he wrote a superb piece on his blog covering slate for the roof. If there's too much reading for you, print out this beautifully illustrated guide, which tells you most of what you need to know and looks brilliant on the railway room wall at the same time. Iain produced a sheet of pre-marked out Countess sized slates and a quick e-mail saw me the proud owner of the file for this, albeit in 4mm scale. 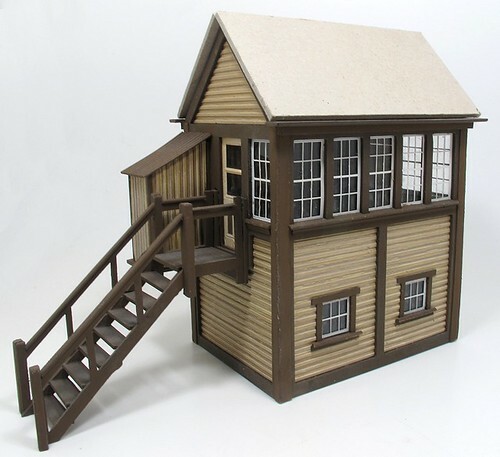 Telling my printer to run a couple of copies off at 175% sorted this out for my O gauge building. Each tile was stuck to the cardboard roof with PVA glue from a pound shop - a big bottle that will do fine for this sort of job. After a while, picking a tile up with tweezers from the pile of pre-chopped ones became quick and easy. Not unpleasant either - I did the job while watching The Ipcress File on TV. You need a nice simple, repetitive job like this while trying to follow a complex plot and enjoy the excellent archive footage of London. Painting slates is something I've always struggled with. Picking out individual ones never looks right to me so I cheated here and whacked a coat of Humbrol 69, Tank Grey (Update: Humbrol 67, not 69!) , over the lot and then worked talcum powder into the nearly dry surface followed by a coat of Testors Dullcote. Time for a model that is special to me. As a youthful modeller, the articles I really enjoyed reading were those written by Alan Downes. His buildings really seemed to capture the look and feel of the real thing without all the faffing around with fiddly detail. While the rest of that edition of Railway Modeller might well have long since headed for the bin, the chances are I could dig out this bit from my box files. 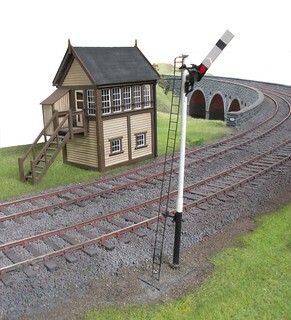 Which is why when Chris Neverd asked me if I wanted a 7mm scale signal box made by Alan, I couldn't really turn it down. OK, there's none of his favourite Pyruma fire cement - the stone for all his stone walls - I'm happy to bag a bit of the mans work. The box is mostly plasticard. It's not a model of any specific location, but then that was never the Downes style, more generic GWR structure. Attractive but wrong enough to annoy purists. That's probably why I like it. There's work to do of course, but that makes it more interesting for me. Very few modellers produce anything that I wouldn't want to tinker with to add my own stamp, although a Guy R Williams loco would be left well alone! When soldering bits of brass or nickel silver together, avoiding burnt fingers ranks almost as high on my list of desirable outcomes as fitting the parts together properly. 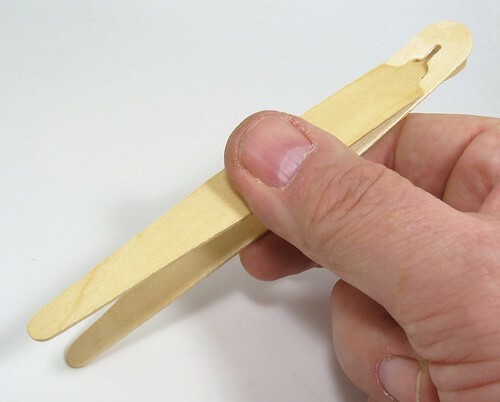 To whit, I've a fine collection of bits of wood, lolly sticks and forks from the chip shop that I use to keep fleshy bits away from hot metal while at the same time holding said metal in place. Last week, while lunching with a friend in Wagamama, a Japanese noodle bar chain, I spotted another candidate for my toobox - a rather nifty wooden easy chopstick device for children. While paying the bill, I asked if I could, despite obviously not being a child, have one of these. Generously I got two. Not bad for a 3 quid tip. 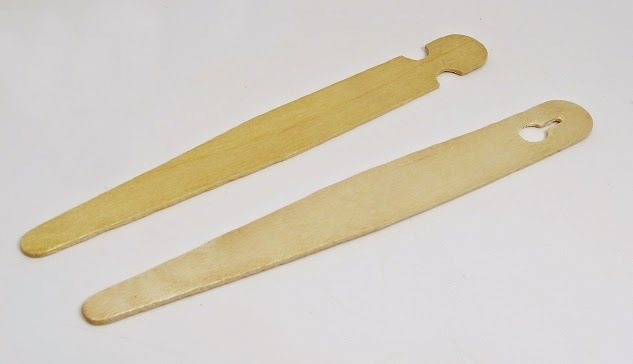 Snacksticks, to use the trade name, are a simple set of tongs supplied are a pair of die-stamped pieces of wood. To use, you assemble the tool, following the instructions on the outside of the packet if required (although if you need them you probably also have to be told not to stick them in any other bodily orifice than your gob). Nifty, and a definite addition to my toolkit. There's probably a market for these too - trouble is the supplier will only sell them in boxes of 1000 and even I don't do enough soldering to require that many. There's no price on the website (look under "on the table/cutlery/snackers & snackstick") but I doubt they will be expensive per unit. With issues concerning the motor/gearbox combo in mind, I thought it might be a good idea to see how the power unit fitted in the coach body beofre going any further. It's quite a nifty set-up. In the roof we have a pivot that takes the (considerable) weight of the body. Front and back of the power unit are curved sections inside the body which are pushed by raised horns on the power bogie. It's very like the method used by older RTR diesels - those fitted with Ringfield motors. You'd hope all this slotted together, but no, the horns are too low. The top bits are at the same level as the curved body sections. Some plastic sheet packing raises them up a bit. Then I found that the front faces are too fat to fit within the curve - time for a coarse file to smooth them back until they went in and moved smoothly. Once fixed, all looks OK. My railcar now rolls back and forth well enough. I haven't tried it on a curve yet, that will have to wait until I find a length of flexi track that hasn't been chopped up. Still, there looks to be plenty of space in here so now it's time to find a motor and gearbox. Not as easy as in the past thanks to the reduction in kitbuilders and loss of companies who sell these bits over the festive period. 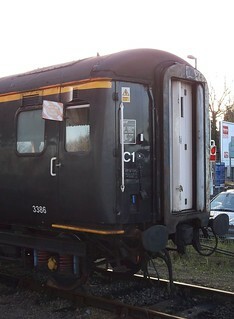 Back at the GWR railcar, the trailing bogie is a pretty simple, if fiddly, construction job. 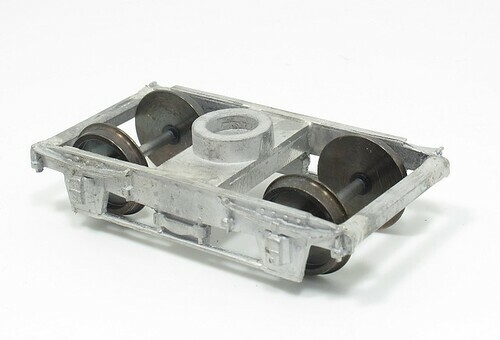 The biggest problem is that if assembled as supplied, the axle ends are nowhere near being held by the holes behind the axle boxes. Filling these with brass bearings didn't help, they were too small for the holes. A set of Peco nylon bearings did the job. These could be pushed in to the holes with some parallel jaw pliers using an old lolly stick to protect the casting. Left slightly proud of the sides, they held the axle points perfectly. The bogie now rolls with no resistance along the track. Another "post a day" year, 365 in all. A few times keeping this going has been quite a challenge but I'm bloody-minded enough to try. 620 visitors a day on average with one day seeing over 1000 for the first time. This has shot up in the last 3 months so we'll see if it holds up. 886 pages per day viewed. 145 returning visits a day. Now well over 3000 posts in total. During the year I've been out and about a bit. There's been a trip on the footplate of Bellerophon, a visit to the Hornby HQ in Margate, Foxdale on the Isle of Man and Burton Beer museum. All this plus the major event - visiting Adelaide in Australia to talk to the British Railway Modellers of Australia convention. The longest flights I've ever taken and the longest holiday I've ever taken too. I met some great people, saw some amazing layouts and a fascinating country. The train ride on the Indian Pacific from Adelaide to Sydney was brilliant but just one highlight among a trip full of them. Back on the workbench, there has been plenty of action. 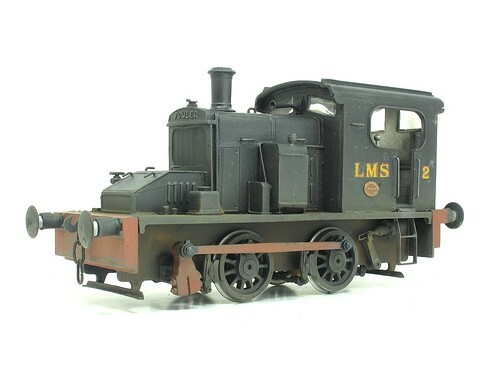 For I start I finally finished the Fowler shunter in 7mm scale. Not back for something at least 10 years old. 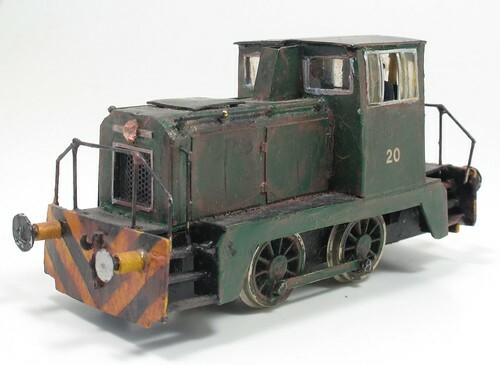 Mind you, I still beat Dapol to producing a shunter even if Ixion just piped me to the post. The 08 still hasn't appeared even in test shot form and I've now sold Clayhanger Yard, the layout I built for it to run on. 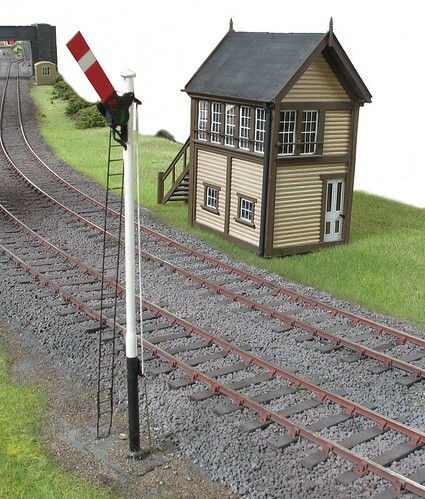 This was a first, I've never sold a layout before and was really pleased to find it a good home. 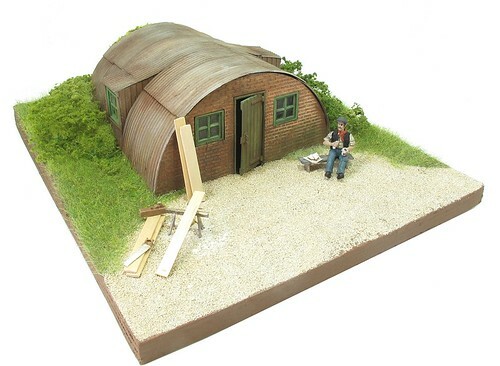 Magazine projects have included one of my favourite dioramas, a Nissen hut based on a 3D printed shell and covered with resin printed surfacing. Wartime modelling has been a theme this year, we had a Rhomney, Hythe & Dymchurch armoured train for a start. 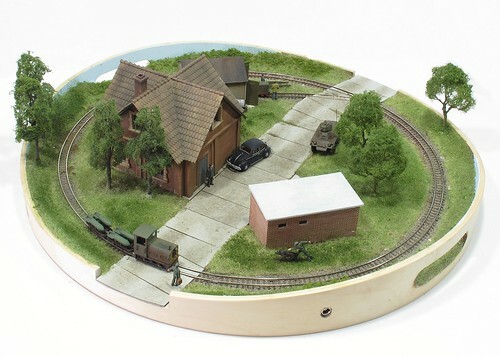 Earlier in the year I'd been given a 4mm scale, 6mm gauge train pack to use as the basis for a cold war era model that fitted nicely on an IKEA wooden tray. More significantly, 2014 saw the centenary of the outbreak of WW1. 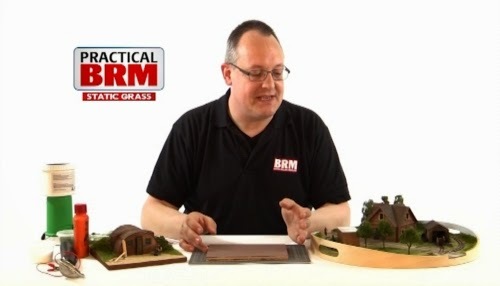 Knowing this would spark a lot of interest and probably inspire many modellers to have a go at layouts set in this era, I decided to follow my heart and set my efforts away from the blood and gore of the front line. Something military without guns and tanks allowed me to celebrate the efforts of the army engineers. "Owen's Bridge", named after poet William Owen, has at it's centre a wooden bridge based on a plan for a design used by the Americans to get over French canals. At a metre long, it allowed me to demonstrate loads of techniques that would be just as applicable to conventional model railways. 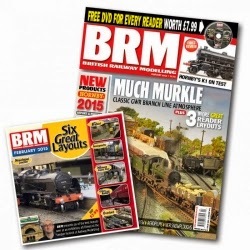 Talking of demonstrating, part of my job now involves me appearing on screen for each issue of BRM. Every couple of months, I have to go and sit in a studio and try not to look too stupid as I talk viewers through a technique or show them around a model I've built. So far, reaction has been positive and we'll be carrying on with the DVD programme for the foreseeable future. So what does 2015 hold? Well, I've a large number of projects on the books. There's also some leftovers from previous years - a couple of industrial Garratts, a radio controlled Bantam Tugboat last seen on May and even a 4mm scale Beetle wagon that just needs painting and has done for 6 months. I'll also need to clear some storage space so some of the old dioramas will be going up for sale, watch this space or if there is one that interests you, get in touch. Not the Nissen hut though, I love that too much to let it go! Let's hope this all goes to plan. I'm sure there will be lots of projects that will pop up during the next 12 months. I hope you continue to enjoy reading this blog and apologise for all the typos.